With modern smartphone hardware - there is little variance in chipset configurations and pretty much everyone has to work within the confines of what ARM has to offer. Hence, under the hood on the Razer Phone 2 we get the industry's favorite Snapdragon 845 chipset, complete with the usual tally of connectivity features and image processing chops. For memory, 8GB of LPDDR4X RAM and 64GB of expandable v4 UFS storage are still perfectly adequate. One aspect of core performance left up to manufacturers and their engineers is cooling. Not unlike many of its competitors, Razer boasts a vapor chamber design. It's an impressive-looking custom design, with quite a large footprint. The ultimate goal Razer has set for itself is to avoid any throttling and performance dips altogether. Keeping that in mind, before we move on to the traditional set of synthetic benchmark runs, we decided to try and verify some of these claims in real-world scenarios. Or at least as close as possible. When dealing with mobile hardware and extended loads one thing is inevitable - heat build-up. Since there is no fans or any kind of active cooling solution, there is really no way of dissipating the heat more effectively. The main consequence from that - a toasty chipset that needs to be cooled down, something that can only be achieved by lowering its clock speed and performance. In other words, thermal-throttling. The latter seems to be tossed around quite a bit as a major criticism. While that might be true in the PC realm, where active cooling is a thing, it is inevitable, at some point. Every phone eventually drops its performance to deal with heat. The Razer Phone 2 utilizes its heatsink design, on the one hand, to dissipate that heat away quicker. Then there is the thermal-throttling and cooling policy. One might think that a big cooling chamber would be leveraged to sustain maximum performance for as long as possible. 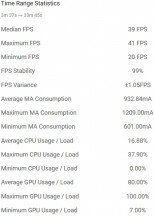 Looking at the above test run, done with a Xiaomi Pocophone F1, we can see at least a couple of major and sudden performance drops. Looking at the same test on the Sony Xperia XZ3, the pattern appears to be full of even more rapid drops. Every time one of those occurs, you can be sure a dip in in-game frame rates and performance will be observed as well. Razer's unique adaptive refresh rate tech might manage to bring the refresh rate down quick enough and smooth things out, but you still want to avoid sudden dips in performance on a gaming device as best you can. 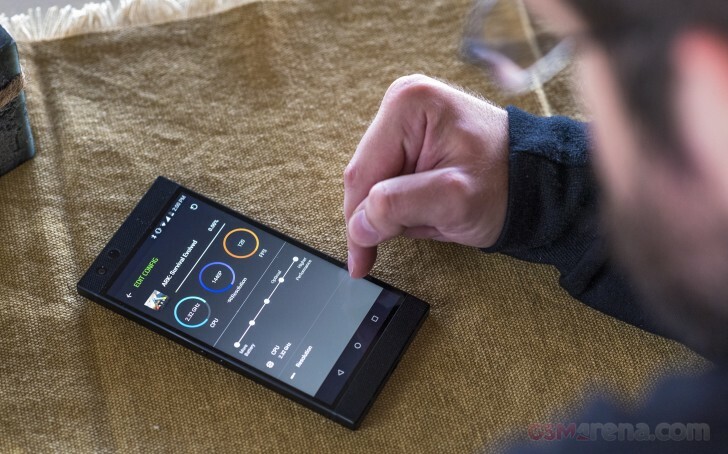 Looking at the Razer Phone 2 throttle test, we can see the different approach. Instead of waiting for the very last critical moment, the handset decides to preemptively dial back speeds a bit, which gives better control over the performance and heat equation. That means smoother performance for longer and more subtle drops. Of course, we also dropped into PUBG to see just how smooth of an experience all this equates to. All the while, monitoring our frame rates using GameBench's excellent toolset. And for the sake of comparison, here is roughly the same run as done on the Xiaomi Pocophone F1 and the Samsung Galaxy S9+. Remember, we are examining FPS smoothness, rather than the maximum FPS count here. All three phones were left to run the game in full-screen mode at native resolution and with the in-game graphics settings set as high as they will go: HDR graphics and Ultra frame rate. Razer's massive cooling solution does have its notable negative consequences. Probably first and foremost, the Razer Phone 2 gets really hot to the touch really quick. Fire up a game and within 5 minutes your hands are going to be almost uncomfortable toasty. Having a case snapped on the back mostly mitigates this, but if Razer's initial plan was to disperse heat so aggressively, perhaps an active cooling solution/accessory, like on the Asus ROG phone is in order. Another unfortunate consequence of Razer's early, pre-emptive, controlled performance drops is the inability to provide short bursts of high performance for long enough to score comparably in some benchmark tests. Looking at benchmark tables, starting with GeekBench, it is clear some aspects of performance are more susceptible than others. In these pure CPU tests, for instance, the Razer Phone 2 clearly delivers pretty much the fullest potential of the Snapdragon 845 when only one of its cores is active. Once all eight cores (4x2.8 GHz Kryo 385 Gold & 4x1.7 GHz Kryo 385 Silver) start ramping up and putting out heat, scores start to plummet. Just to better illustrate the whole heat management situation the Razer Phone finds itself in, we also ran all the tests with our own external active cooling solution, constantly taking heat away from the phone. In certain workloads, like the above all-core test, the variance in performance is huge. 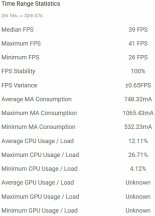 Looking at a more well-rounded benchmark, like AnTuTu, we can see that in a more balanced, closer to real-world usage scenario, the Razer Phone 2 doesn't really have any significant problems with heat. Its massive internal cooler handles things well and adding extra cooling has little to no effect on numbers. Basemark paints a pretty much identical picture. So, it's clear that with regular, every-day productivity tasks, the Razer Phone 2 performs exactly like any other Snapdragon 845, 2018 flagship. GPU workloads, however, are a whole other story. A cooled Razer Phone 2 is clearly a better performing Razer Phone 2. At least in quick short bursts and as far as maximum FPS is concerned. As the render scene difficulty and OpenGL ES versions increase, the difference between the hot and cooled runs starts to shrink. That's perfectly understandable as other performance bottlenecks start to come into play to a greater degree than pure number-crunching power. Plus, there is the matter of better API optimization, increasingly employing concepts like distributed, balanced and even heterogeneous computing. Just a friendly reminder while looking at the performance charts that any on-screen frame rates are dependant on the native device resolution and hence skewed. The OnePlus 6T is a perfect illustration here, competing against higher-res devices. As usual and especially considering the Razer Phone 2's particular approach to performance maintenance, BaseMark X provides a more accurate representation of the overall graphics potential of the device. It is clearly very generous to the Razer Phone 2, as well as the original Razer Phone, for that matter. Razer is leveraging its vapor chamber cooling to offer a high thermal ceiling of the chipset operation. We get higher theoretical maximum fps level at the expense of slight user discomfort. The result is one hot to hold gaming device which delivers the the highest possible sustained fps during longer periods of time. But, what happened to the promise of ultra-smooth 120Hz goodness? Valid question and one we made sure to test thoroughly. Firstly, we have to give credit where credit is due, Razer definitely managed to optimize its Android UI to take full advantage of the variable, high-refresh rate panel. Every motion looks buttery smooth. And it's not just system animations. Every scroll on a web page instantly results in a rendering fps hike all the way up to 120 fps and an incredibly crisp scroll effect. No blurring or tearing whatsoever. Browsing on the Razer Phone is a great experience, even if most multimedia content online is still played back at 30 fps. Plus, every intermittent moment before the hardware manages to react to the motion and ramp up the fps count, everything remains perfectly smooth as well, thanks to the variable refresh rate. 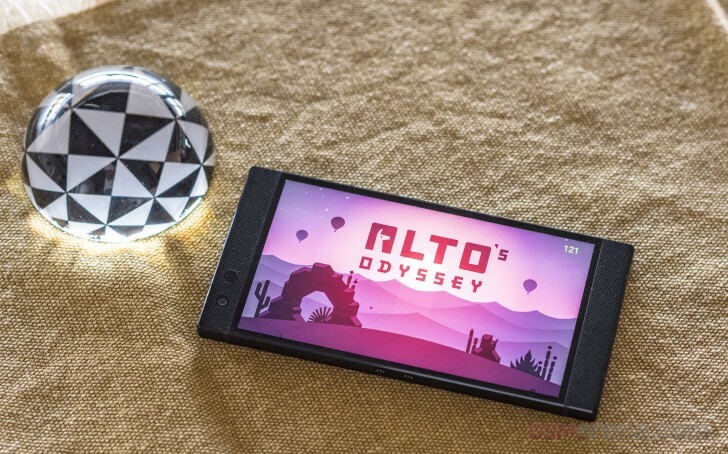 However, even though almost a year has passed since the original Razer Phone made the leap to 120Hz, the Android OS and ecosystem are still not really prepared to handle anything beyond 60 fps. And it's not necessarily that the Adreno 630 is not powerful enough to push all the frames, it's just that most of the existing app ecosystem, including game engines, is not designed to work under such conditions. Perhaps a second "Project Butter" will happen at some point to make that a reality, but currently, Razer is stuck in a mostly unfavorable early-adopter position. To Razer's credit, it has been working really hard over the past months in aiding third-party developers to optimize their games and apps for 120Hz. The result is a list "UltraMotion" supported titles, which you can check here. As per the description, all of these are optimized for dynamic high refresh rates, but not necessarily all of them can reach 120 fps and saturate the display. We made sure to test at least a few of these titles on the Snapdragon 845 and its Adreno 630 GPU, as found inside the Razer Phone 2. Some titles definitely worked better than others, so your mileage may vary. If you are really adamant about getting every last frame possible out of a given title, which you have verified as capable of more than 60fps, there are a few things you can do. For one, there is a really convenient FPS counter that can be enabled from within the developer settings, so you can measure if your optimizations have any effect. Then there are Razer's neat per-app performance tweaking options. These allow you to set a refresh rate cap, a CPU frequency and a resolution. We encourage you to play around with combinations of these for every titles, just like you would do on a PC. Keep in mind that beyond Razer's official list of UltraMotion games, it is not uncommon to find ones that can hit 120fps. These are typically less graphically intensive, like Alto's adventure and BADLAND 2, which both easily reach up to 120 fps. We also looked into remote play for some of our favorite PC games on the Razer Phone 2 to potentially take advantage of the high refresh rate. A couple of solutions do exist, like Nvidia's Game Stream with a compatible client (Moonlight). Unfortunately, all the apps we checked out are currently capped at 60 fps for one reason or another, exactly like they were back when the original Razer Phone was released. Perhaps, we'll see how things evolve over the following months. Here's hoping Razer releases a solution of its own, perhaps accompanied by a gamepad accessory for the best possible experience. Still, even in its current flawed state, we see potential in Razer's ULTRAMITION panel. It is an important early effort to spearhead high refresh rate gaming on mobile devices. If the PC realm is anything to go by, it is a good and logical upgrade path to explore in the future. Definitely one mobile gamers will eventually come to appreciate.